Should Home Inspectors Predict the Future? As a Seattle Home Inspector I sometimes get to play fortune teller as well inspector. 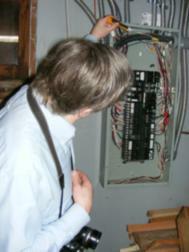 For example, a few weeks ago I inspected a brand new Condo building---the whole thing---all five units. Feelings of deja vu go right along with the business of telling fortunes. When going through five very similar units, by the time I got to the third unit I knew ahead of time what defects I could expect to find. Defects have a way of repeating themselves when done by the same sub-contractor. All-in-all there were not a lot of issues with the building----but the few that there were tended to repeat themselves. But this is not the kind of fortune telling I am talking about. I am talking about knowing the future of the people that don't even live in the building yet. Those future tenants of the building that don't even have any idea that they are going to live there yet. It is THESE people who's future I know. Take a look at this driveway. Now you cannot get a real sense of how steep this driveway is from the picture---but take my word for it---it is VERY steep. Here is where foreseeing the future comes in. I know for a fact, that on some occasion during the winter, those who have parked their cars in this underground garage will be taking the bus to work. So when the inspection report says the driveway is steep---it says that for a good reason. PS, Those of you that follow my blog on a regular basis will remember that all my posts come with a <point>---and this one obviously has more points than Oblio---can you see them? Summer time---time to jump in the Pool! I have no clue what it is---so it can't be very important. Why is there an inflatable doll in my chimney? Thinking-caps and vent-caps---they are there for a reason. You have to ask yourself, "Do I feel lucky? " Elephants and keggers---you just never know.